The CD is dead... long live vinyl? As digital downloads and plunging CD sales lead to the demise of yet another big music chain in Singapore, boutique stores specialising in vinyl records have been opening and thriving. Music chain Gramophone closed its last store at The Cathay for good in September, after 22 years of business and as many as nine stores four years ago. HMV shuttered its four-year-old, 12,000 sq ft flagship store in Somerset on Tuesday, leaving only its smaller store in Marina Square. Yet, three new boutique music stores have opened in the last year: House Of Turntables in Plaza Singapura, Vinylicious Records in Parklane Shopping Mall and Hear Records in Burlington Square. And business has been good, report the owners - thanks to a revival of interest in the old-school vinyl format. At Vinylicious, which opened in December last year, sales have been increasing by between 20 and 30 per cent a month since the start of its operations, says its owner Eugene Ow, 41. These days, he adds, the store sells an average of 1,500 records - both new and used ones - a month. Unlike digitised music, he says, a vinyl record is far more tangible. "There are many senses at work. When you take a vinyl out of its cover, you smell its distinctive scent, then you touch the grooves and finally you put it on the turntable and hear and feel the music coming out of the speakers." House Of Turntables sells about 200 records a month. Hear Records declines to reveal figures. Mr Nick Tan, 42, founder of Hear Records, says that while the scene is small, it is vibrant. His store opened in March. He says: "People don't just come to the store to buy records. They meet other music fans as well and we all end up talking about music." The most prominent among these new stores is House Of Turntables, which opened its doors in October last year. It is the second store under the House Of Turntables banner owned by music lover Kevin Pang, 43, who opened the first one at Bras Basah Complex in 2011. Before that, he also opened a vinyl store, Northstar, in an Ang Mo Kio industrial estate from 2009 to 2011. The three business owners do not see one another as competition and welcome the arrival of more independent record stores. Says Mr Ow: "If a customer comes to my store and I can't find what he wants, I wouldn't hesitate to refer him to other shops. "In fact, on my days off, I go to other vinyl shops in Singapore to buy records for my personal collection." Hear Records' Mr Tan says that new record shops can help to increase the number of vinyl collectors here. "If there are 10,000 vinyl fans in Singapore, instead of fighting over these 10,000 potential customers, my belief is that we can work together to increase the number to 15,000 vinyl fans." 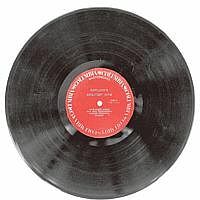 The standard music format from the 1950s to the 1980s, vinyls gave way to cassettes and CDs in the 1980s. However, the black analogue discs are slowly inching their way back into music fans' collections. According to the store owners, this vinyl revival started gaining traction among local music fans in the last two years - on the heels of a global trend. Last month, the British press reported that sales of vinyl records in Britain, while still not huge, are at their highest in a decade. In 2007, vinyls made up 0.1 per cent of music sales. British Phonographic Industry, a trade body representing the record industry, reported last month that the rate had gone up slightly - to 0.8 per cent. Figures for vinyl sales in Singapore are unavailable and CDs still make up the bulk of physical music sales, according to Universal Music Singapore's marketing director, Mr Lim Teck Kheng. He says that while vinyls are still "niche", more of the label's acts are putting out their releases on vinyl. "It's not just the re-issues and releases by veteran bands such as the Beatles or Velvet Underground, but albums by current acts such as Lady Gaga and Chvrches are also available on vinyl," adds Mr Lim, 42, who has more than 5,000 records in his personal collection. Chvrches' debut record The Bones Of What You Believe was released in September, while Lady Gaga's new album, Artpop, will be released today. Vinyl editions of new albums cost more, from $30 to $40, compared to CD versions, which cost about $20. In April, vinyl collectors here celebrated Singapore's first Record Store Day, a global event in support of vinyl culture and independent record stores. Vinylicious, for example, sold limited-edition records by bands that include home-grown acts such as Bored Spies and I Am David Sparkle. Vinyl fan Darren Tan, 32, says that he attaches more "sentimental" value to music coming from a record than from a digital format such as MP3. He is one of the co-founders of audio-visual online project Vinyl Of The Day, which celebrates vinyl culture through their website, www.vinyloftheday.com, and social media. He and the other two founders, Mr Kurt Loy, 32, and Mr Gerald Ang, 35, are also music producers and DJs who spin music the old-school way, with actual records, as opposed to using music on CDs or digital format. Mr Tan says that he is seeing more fans in their late teens getting into vinyl. "I think it's because a lot of popular indie bands nowadays are putting out their releases on vinyl." He also welcomes the opening of new vinyl stores here. "There's a lack of physical music stores for fans of vinyl here to gather and meet one another, and these new shops fill the gap." Music fan Eugene Ow, 41, realised his teenage dream when he opened Vinylicious Records, a store selling vinyl records, in December last year. Choosing to set up shop at Parklane Shopping Mall was a calculated move too. "One of the most iconic record stores in Singapore, Valentine Music Centre, used to be here and that was where I used to go to buy records when I was still a teenager because it was near my school," says the alumnus of St Joseph's Institution, which used to be in nearby Bras Basah Road. "So this old shopping centre brings back a lot of memories for me and my peers." Valentine Music Centre is no longer selling music but distributing audio equipment. Vinylicious Records stocks used and new vinyls. Prices range from $10 for singles to $600 for rare records such as Reanimation, a 2002 remix album by rock band Linkin Park and hip-hop supremo Jay Z, of which there are a limited number of copies in the world. Mr Ow started collecting vinyl at the age of 16 and, by last year, he had amassed 5,000 records that filled up one room in the four-room flat where he lives with his girlfriend, 40, who helps him with the vinyl store and his interior design business. "My collection was getting a little out of hand," he says with a laugh. "And one day, my girlfriend said to me, 'We need to free up some space' because the collection was just taking up too much room in the flat." He started selling his vinyls to fellow collectors, opening up his house on weekends to vinyl hunters. The regular visits from other record fans led to him rekindling his youthful ambition of opening his own music shop. "With all these music stores closing down and with more people turning online to search for music, I felt that something was getting lost. I wanted to bring back that culture of going to a shop, of physically going through albums and interacting face to face with other music lovers," he explains. Initially, the shop was a partnership with a fellow collector who bought his used records, Mr Teo Chee Keong. But Mr Teo left the business in July to concentrate on his child enrichment business. Mr Ow himself also runs his own interior design business, but spends most afternoons taking care of the vinyl store, which opens at 1pm every day except for Mondays. He employs part-timers to take care of the shop whenever he needs to handle his interior design projects. He prides himself on having a broad selection of music at the store and points out that he sells the music of global pop acts, such as Justin Timberlake, and local indie acts, such as Hanging Up The Moon. "I don't have a typical customer," he says. "I get all kinds of people coming in to buy records, whether it's the teenager looking for an indie record or the middle-aged fan looking for music from when he was younger. And that's exactly how I imagined the ideal music store to be, one that caters to all types of music fans." First-time customers to Hear Records always ask its owner Nick Tan the same question. "They tell me, 'I already have this album on CD. Should I buy it again on vinyl? '," says Mr Tan, 42. "My answer to them is 'yes' and not because I want to make a sale. Even if you are familiar with the songs, whether you've been hearing it on CD or on digital files, when you hear it again on vinyl, it's a whole new experience. You will fall in love with the music all over again." He is a firm believer that vinyl collecting should not be only for those with deep pockets. The father of three children, aged eight, six and two, prices his vinyls from $7 for a 7-inch single to $80 for a box set. "I don't believe in stocking collectibles that cost hundreds of dollars," he says. "I want to keep it affordable so that even students can afford to buy the records." The store stocks 3,000 used vinyls and about 1,000 new albums and reissues in a variety of genres, from metal and pop to indie and classic rock. Mr Tan also sells turntables. Prices range from $390 for USB-1 brand/model to more than $3,000 MMF 9.1, both by American company Music Hall. He declines to reveal sales and investment figures, but says the store is "not about making money". "I want to help get music fans back into the act of buying music in a physical format." The former civil engineer decided to open a vinyl record shop to be his own boss: "I spent the last 20 years working for other people and now I want to spend the next 20 years working for myself." He acknowledges that there is no guarantee that the retail vinyl business can survive. "But you have to try and not just give up. Something must be done to make sure that the vinyl store is not a sunset industry and opening this store is my contribution to ensure that it stays alive," he adds. And if customers cannot find what they are looking for in Hear Records, he has no qualms directing them to other record stores and displays stacks of namecards of other local vinyl businesses near the entrance of his shop. He says: "I think there is room for more record stores in Singapore and when more stores open, I believe that Singapore can be a hub for regional vinyl fans." He acknowledges that while the community of vinyl fans here has become bigger in the last two years, many do their shopping online, where used and new vinyls can cost less than in stores here. But buying records on the Internet has its own set of problems. Sometimes, the records get damaged in transit, he says. "Besides, where is the fun in buying records in front of your computer, when you can go to a record store and meet and interact in person with other music fans? Most of my customers end up being my friends and they come here to hang out, listen to vinyls and discuss music." House Of Turntables at Plaza Singapura is the third record store that Mr Kevin Pang, 43, has opened in the last four years. To date, he has spent $300,000 to $400,000 of his own savings on his vinyl ventures. With its premium Orchard Road location, his newest 900 sq feet store is also the most prominent independent record store in Singapore. "I get a lot of walk-in customers at Plaza Singapura, not necessarily serious vinyl collectors but music fans in general," he says. A one-stop-shop for the vinyl fan, the store also sells turntables and their accessories. Vinyl prices range from $25 to $110, while turntables cost $550 to $19,000. Mr Pang stocks only one turntable brand, Pro-Ject Audio Systems. The economic downturn in 2009 prompted him to quit his cushy job in the financial industry to start his own vinyl record business. He caught the vinyl bug while he was in secondary school and started buying releases from 1980s pop bands such as Johnny Hates Jazz. Today, he has about 2,000 records in his personal collection. His first store, Northstar, was located in an Ang Mo Kio industrial estate and it lasted for 11/2 years from 2009 to 2011. The lack of walk-in customers prompted him to close Northstar and open up his next store at Bras Basah Complex, House Of Turntables, in April 2011. It is still operating today and is looked after by his father, 71, and mother, 73. His wife, 44, helps out in marketing both stores, while their 14-year- old daughter helps to select releases by current music acts. Both stores stock 20,000 records in total. Newly released albums make up 25 per cent, while the rest are either re-issues or used records. Some of the rarer, more coveted records in his shop include picture records, with artwork imprinted on the disc itself, by the likes of Teresa Teng and Sandy Lam, which cost about $110. The Plaza Singapura store sells an average of 100 new records and 100 used records, while the Bras Basah outlets sells 150 used and about 20 new ones in a month. "Business at the Plaza Singapura store has doubled since we opened a year ago," he says, confident that sales can still go up. His customers are both male and female aged 30 to 35 and include Singaporeans, expatriates and tourists. While CDs are getting less popular, he says that vinyl is on the comeback because of its history. "I think fans want to go back to a time when vinyls were the main format for albums." Mr Pang travels to the United States and Europe at least twice a year to source for records and ships back up to 3,000 used vinyls each time. He says: "I do a lot of research and use my own initiative to select which vinyls to stock at the two stores." The best thing about running his own vinyl record business? "I get to choose first which vinyls I want to keep for myself," he says with a smile.